Whether on Carnegie Mellon University’s campus, studying abroad or even on spring break, students, faculty and staff are constantly examining the ways in which the world works. This semester, three groups traveled to France, Cuba and Northern Ireland as part of experiential learning opportunities. In each case, students documented their time abroad to create multimedia projects upon their return. Under the guidance of Sébastien Dubreil, teaching professor of French and Francophone Studies, second language acquisition and technology-enhanced learning, students went from Pittsburgh to Nantes, France, where they explored every corner of the town to create a multimedia project on the French language and culture. The course’s interdisciplinary nature allowed each student to choose a topic and mode of execution specific to their areas of interest. Projects varied from analyzing how language affects cultures across professional and personal contexts to creating an interactive website featuring the Nantes Cathedral—one of the city’s oldest artifacts. Another student created a VR-enhanced board game. One team even toured “Le Grand Elephant,” a 60-foot-tall mechanical elephant housed in the Machines de l’Île and turned the exploration into a virtual reality experience. Each of the multimedia projects will be on display in the new David A. Tepper Quadrangle. Patti Kenner (MM’66) and the Indian Trail Charitable Foundation gave CMU $1 million to create a technology-rich global languages and cultures room in the new David A. Tepper Quadrangle. The interactive learning space will create a space for the Dietrich College of Humanities and Social Sciences and Department of Modern Languages in the new campus building as well as heighten the importance of languages, cultural awareness and the university’s global profile. Last year, Ralph Vituccio, associate teaching professor in the Entertainment Technology Center, and filmmaker Andres Tapia-Urzua created a transformative documentary-making course that took students to Camagüey, Cuba. The course returned for a second year in a row, this time taking 10 students out of their element and into the streets of Cuba to capture what makes the country unique through an interactive documentary. Students spent the week behind the camera, detailing various cultural aspects of Camagüey, including working artists, street life, dance, music and interviews with locals. For many taking the course, this was their first time being involved in a documentary from start to end. The students shot, edited and translated the video. They also designed the interactive elements of the documentary and all art assets. “In Cuba, what we did as a class was more than just filmmaking, it was deeply personal to look into the hearts and minds of the people of Camagüey,” said Connor Hanley, a senior information systems major. “I’m so excited and proud of what we did, because our documentary gives each visitor a chance to experience Cuba in their own unique and intimate way. I will never forget the memories and the friendships that I made in Cuba and hope that someday my life brings me back there." “Art, Conflict and Technology in Northern Ireland” was taught for the third year by John Carson, professor of art, Jennifer Keating, assistant dean for educational initiatives in Dietrich College, and Illah Nourbakhsh, the K&L Gates Professor of Ethics and Computational Technologies. The class took students to Belfast and Derry, also known as Londonderry, in Northern Ireland where they learned about the strife and post-conflict reconciliation efforts associated with Northern Ireland. Northern Ireland’s high profile internationally monitored peace negotiations have served as a focus for research and artistic production, in the United Kingdom, Ireland and abroad since the 1960s. The course aimed to immerse students in the exploration of visual and literary art that conceptualizes, contends with and criticizes narratives associated with Northern Irish violence, development of democratic processes, individual and group identity formation and the influence of evolving technology on these social and political phenomena. 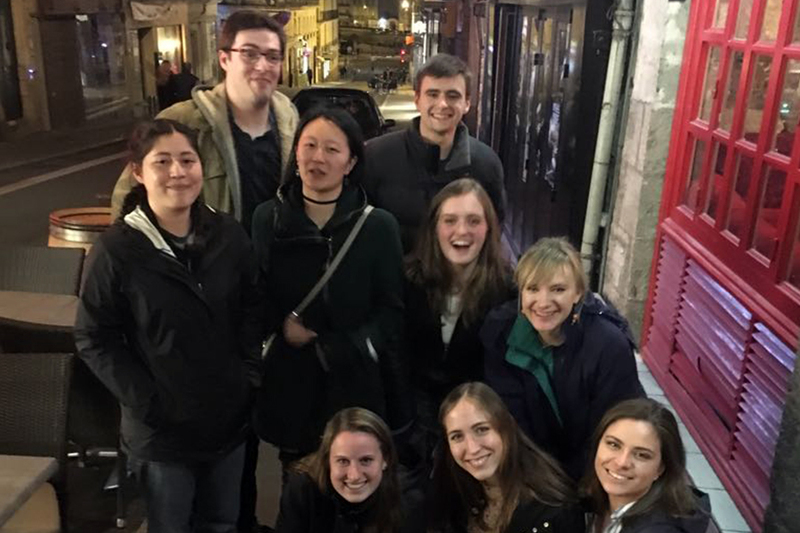 Pictured above: One group of students traveled to Nantes, France to learn French through media creation.